The room was perfect. Not too small and incl. a well-equipped kitchen. The location of the hotel was optimal because of the shopping center nearby and the staff was always friendly and helpful. Good breakfast buffet, room was clean and comfortable. good experience. Great relaxed friendly atmosphere, fresh and clean rooms but breakfast needs some improvement. Generally, the service is friendly and efficient. The hotel staff are always happy to help and the cleaners do a great job of keeping the place sparkling clean. However, during my stay there was an accident with the plumbing system which meant the entire top floor (which included my room) became flooded with water very quickly; A potentially a dangerous situation. I wasn't very impressed with the reaction of the staff to this emergency. Clearly, their first priority should have been to ensure the safety of the Adagio's guests, but instead they seemed to be confused about what action to take. In end I had to take the initiative and evacuate myself from my room. Ultimately, the staff helped me moved me to another room and a few days later I received a letter apologising for the inconvenience. However, I was really more concerned about the danger this situation had exposed me to. My impression is that the staff don't have any training on what to do in such emergencies and I wonder what would happen if there was a fire in the hotel. I was surprised with the bedroom, everything was cleaned and organized, and the bedroom I stayed was so big. I really didn’t expect, I liked the breakfast too! So...thanks! You should do it better ! Great place to stay while on business, good choice of rooms, good place to work and relax. Overall Adagio Sao Bernardo is clean and run efficiently by the friendly staff. My only requests are that the gym space be made a little bigger with more good quality exercise equipment and that the laundry facilities need some improvement with better information on how to operate the machines and a better way to facilitate their use. Regarding the gym. The current space is too small and becomes uncomfortably crowded and hot (even with the AC on) with just three or four people exercising together. Although the existing bicycles, treadmills and leg press are OK, the multi-function single seat gym equipment is overly complex to use and of poor quality. These factors don't encourage people to make use of the facilities. With more space, less complex (multi-station or single use) exercise machines can be installed which means that more people can exercise simultaneously and with more comfort. Regarding the laundry facilities. These appear to be coin operated but, unfortunately, it's not clear what coins are needed and what is offered. But, more importantly, as there is always a shortage of coins in Brazil, it is difficult to make use of these facilities. A more convenient way to pay to use these machines could be via tokens or swipe card linked to the user's room number. With these improvements, I would not hesitate to return to this aparthotel regularly. If you would have made the beds every day it would have been a good experience. 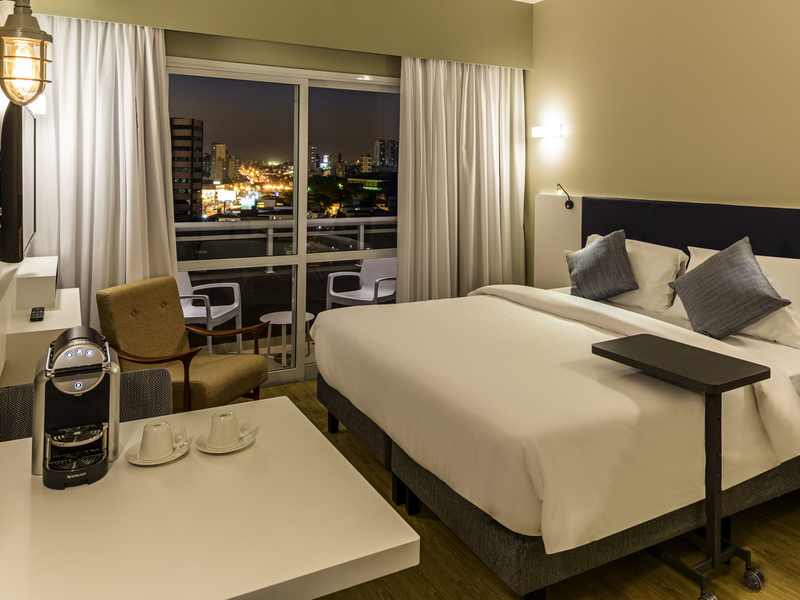 Good location, near a shopping mall and close to the main highway, so it is faster to get to the places you need, in São Bernardo or even in Santo André However, the lack of a restaurant and room service is a bit frustrating, since I arrived late at night and all I wanted to do was order a dish and eat inside my room. In my opinion it can be the perfect place if you look for a good night sleep. Not a place for those who enjoy comfort and hotel services. Very nice room with a great view, breakfast could do a bit better. Really liked the room and the possibility to be able to choose if I want be on one of the upper floors, or the lower ones. Was great to have a kitchenette as well. The only downside was the breakfast, the coffee machine didn't work and the offer was below my expectations. According to the room level I had I would have expected the breakfast to be better. Room size and features are good. Staffs are courteous. Let me write the opportunities. A English newspaper delivered to room would help to know happening of the city, events and in general would give knowledge of the country. Breakfast spread is decent, but at least 25% change would make it interesting every day. Internet connection is room was poor, multiple requests to fix it did not help. Access to internet via laptop was good but it was not working via TV. Worse in my 2 weeks of stay hardly it worked for just 1 day. Lift is a big challenge - my fellow team members were put up in 16th floor and I was put up at 14th - only 1 lift would take me to 16th and obviously cant expect it to service me always, the right hand side lift would not take me to 16th..so better I used to work using the stairs. There is very limited information on tourist places and shopping centers available at the front desk. Typically in business hotels we used to have a office space with a photocopier, fax, system with internet facilities - imagine our challenge to access such facilities outside in a place where English is a challenge. Finally our stay was made very comfortable because of Adilson, an English speaking taxi service provider, he was very humanitarian, charges were very decent, helped us with purchase, food etc. I strongly recommend your management to utilize his services for international customers - he can be reached at 94…. Obviously this is my suggestion and let your management to take their own decision. The experience was excellent, the room was great and the staff was very friendly.